Reforming the nation’s health care system will bring sweeping changes to one-sixth of the American economy, and will alter the way healthcare is delivered. Changes of this magnitude demand careful deliberation and in-depth study before implementing any significant level of change. The evidence tells us that this isn’t what’s happening. The tenets of good government prohibit introducing measures like H.R. 3200, America's Affordable Health Choices Act of 2009, a bill of more than 1,200 pages that House leaders tried to ram through before the August Congressional recess to please President Obama. Almost nobody had read the bill, and there had been no debate on its provisions. A couple of legislators actually admitted that it was futile to try to read and understand bills like that. Such irresponsible behavior is not what the Founders envisioned, nor is it what the American people expect or deserve. Representatives and Senators were elected to represent their constituents sensibly. When citizens witness them behaving stupidly (to borrow a phrase), voting on measures without knowing what’s in them – as they did on the Waxman-Markey bill – the citizens have every right to get upset and even to shout at them if they want to. They are public servants, not royalty. They work for us. The $64 question is, why produce thousand-page bills that will dismantle the current health care system instead of simply repairing it? Is it possible that solution never occurred to anyone in Washington? Or is there a different reason? The Secretary’s Corner at HealthReform.gov states the following: “Under the status quo, too many Americans can’t get the affordable care they need when they fall ill.” And later, “health care costs are crippling [the] ability [of small businesses] to offer and sustain health insurance for their workers – limiting their competitiveness and shifting costs to families.” There is also a statement supporting increased attention on prevention. So, Health and Human Services Secretary Kathleen Sebelius and President Barack Obama identify the cost of health care and health insurance as problems, and think we need more emphasis on prevention. Fair enough. Aren’t members of Congress and the administration smart enough to address those problems without creating a new government bureaucracy that will be as inefficient and expensive as all the others? What sense does it make to give up a good system that needs some fine tuning for nothing more certain than the hope of something better? As nations go, the United States is young; it is an adolescent, and is behaving just that way. Right now we are going through the fits and throes of pubescent girls and boys, overcome by emotions and hormones. Many of us have forgotten all that this country has accomplished quite independent of its government, perhaps in spite of it. 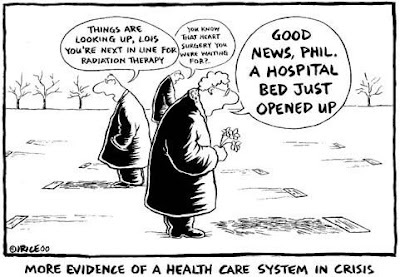 One great thing we have is our health care system, which while imperfect is the best in the world. People come here from other countries to get the care they can’t get at home under their government-run systems. We have the most modern medical technology, and more of it than anyone, and we have the newest and best pharmaceuticals. Yes, those assets are expensive, but we don’t want to give them up. There is no reason to give them up. If small businesses can no longer afford the costs of health insurance for their employees, then separate health insurance from employment. That never made any sense, anyway. Why should health insurance be administered differently than auto or personal property insurance? What began as a fringe benefit offered by a few businesses to attract and retain good employees has spread and become the de facto way things are done, and is now a source of much consternation and gnashing of teeth. If health insurance is too costly, attack the reasons for that. Medical liability reform will reduce or eliminate defensive medicine practices that add so much to the cost of medical care, and also increases the price of medical malpractice insurance that costs hospitals hundreds of thousands or millions of dollars a year and costs most doctors tens of thousands of dollars a year. Relieve insurance companies of the mind-boggling maze of regulations that drive up costs. Work to make policies portable from one state to another, regardless of the details of employment, and to standardize state regulations for insurance companies. Increase Medicare reimbursements to cover billed costs so that the unpaid balance isn’t shifted to patients with insurance, and eliminate or substantially reduce waste, inefficiency and abuse in Medicare. Encourage wider use of health savings accounts and health care co-ops that provide options, but do not cede control. It won’t be that hard to solve the problems of the current system. But to do that we have to have legislators and an administration that realize that government isn’t the solution to all problems. Democrat leaders are determined to get a public option into the reform process – sneak it through the back door, if necessary – and that is the first step to turning our system into one like the Canadian and English systems, with the long wait times and rationing of treatment and medication that plague those patients.